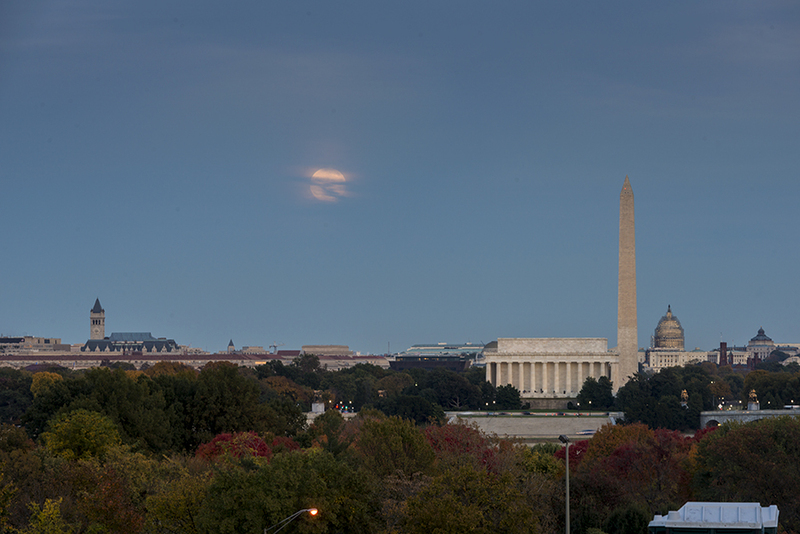 When you are trying for the classic moonrise over the city of Washington, DC, everything has to go perfectly. Several of us made the effort on October 26th, knowing the weather would be bad on the following night, the night of the full moon. We also knew before we arrived that conditions would not be perfect because the moon was coming up 15 minutes before sunset and it likely would be too high in the sky by the time the twilight blue was at its peak and the illumination of the Lincoln Memorial, Washington Monument, and US Capitol were in balance with the ambient light still in the sky. We also knew that the clouds could pose problems. But, when we arrived, there was an additional problem. 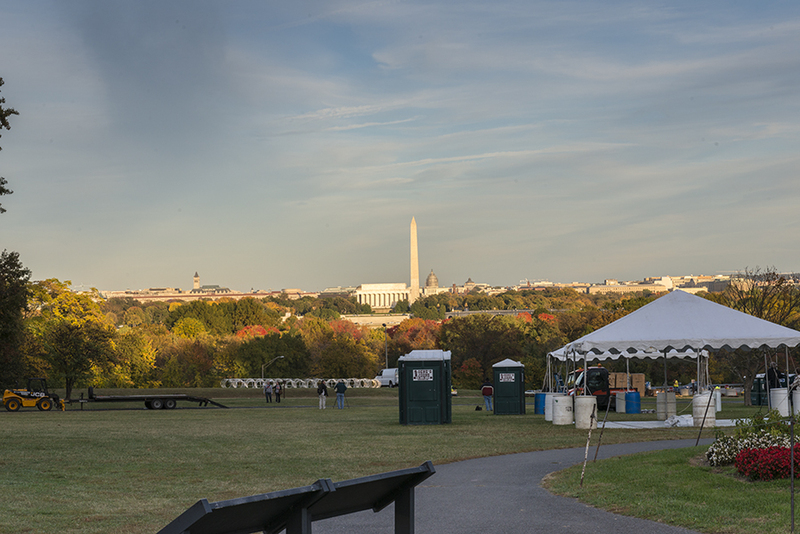 The Marine Corps Marathon had been held on the previous day and our chosen location (near the Marine Corps Memorial) was also the location of the finish line for the race. A massive disassembly effort was underway. But, aside from the occasional passing vehicle, there was nothing that was directly obstructing the view. By 6:15, the official time for the sunset, the moon was already pretty high and it was still too bright to see the illumination on any of the buildings below us. At 6:30, the twilight was a nice blue color, the clouds had abated, but the moon was too high. So the only solution was to back off the focal length, and take the full scene and then do some post processing cheating. The image above was taken with the telephoto zoom extended to 200 mm and the moon in its actuual location at the time. The image below, taken a few seconds later with a 145 mm focal length, shows the moon in a decent location. But it was just “moved” down during the postproceesing from where it was at the time the image was taken. Not a bad result, but not something I will post on my website or offer for sale. 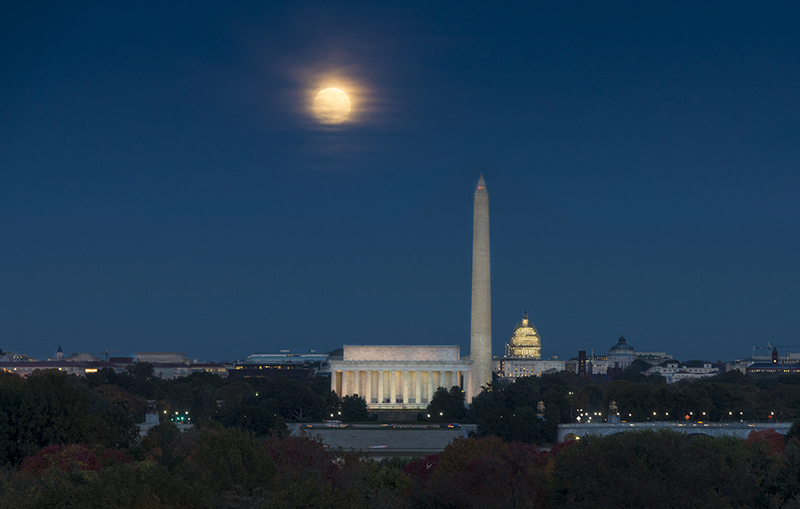 If one wants to capture an image of the moon rising over the “Big Three” (Lincoln, Washington, and US Capitol), the specific location is right in front of the Netherlands Carillon a short distance south of the Iwo Jima Memorial. Using the well-known app “The Photographer’s Ephemeris,” the moon should be rising at an Azimuth reading of about 85 degrees. 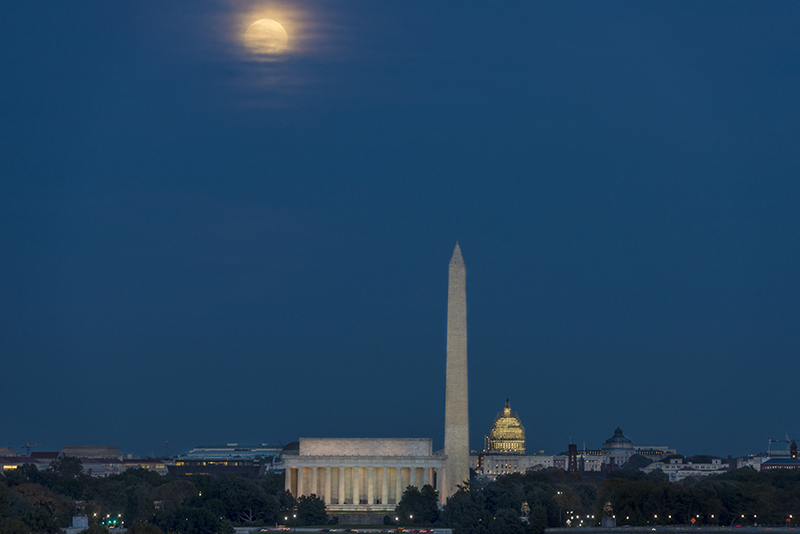 For ideal twilight conditions along with the lighting of the “Big Three,” the moonrise time should be about 15 minutes after sunset. September 27, 2015 was the last chance to see a total lunar eclipse in the eastern United States until 2019 according to the cognoscenti. So even though the skies had been overcast for several contiguous days I didn’t want to wake up this morning and learn that there was a miraculous parting of the clouds for the entire event. I had a place all picked out for the moonrise, but the clouds close to the horizon blocked the view. But the next time moon rises at about 90 degrees east (due east), this wouldn’t be a bad place to be. 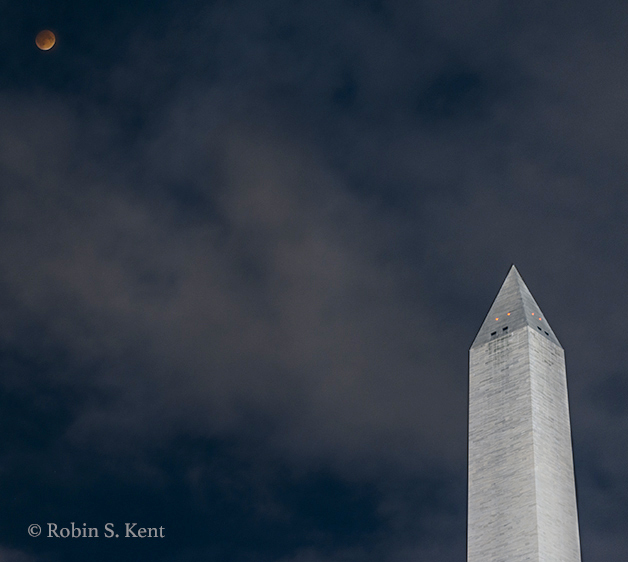 Without the clouds, it would have been right next to the base of the Washington Monument. Then, as the time approached for the actual eclipse to begin, I moved over to my chosen location near the German-American Friendship Garden along Constitution Avenue. The location itself looked like it had potential for a night shot, so I tried a test exposure with my wide angle lens. But the eclipse was due and the clouds seemed to be breaking up so I set up a few yards away with the hope of getting a series of exposures as the moon tracked across the sky into the earth’s shadow. These would then be combined into a single image in post-processing. 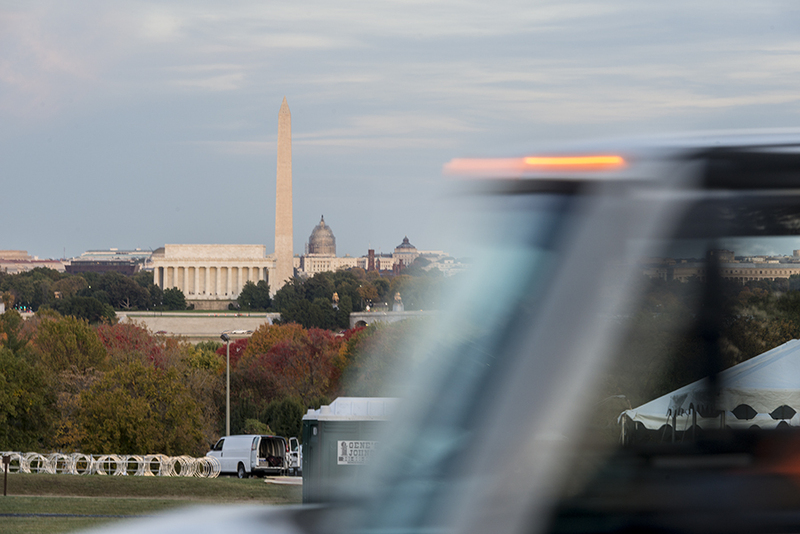 This, of course, requires a wide angle lens and, because of the timing, a tall building to add some interest to the exposure and the Washington Monument certainly qualifies. But the skies didn’t really clear and I suspect the substantial amount of clouds in each image will make for a prolonged post-processing effort that may lead nowhere. However, here is a cropped version of one of the images during the totality phase. 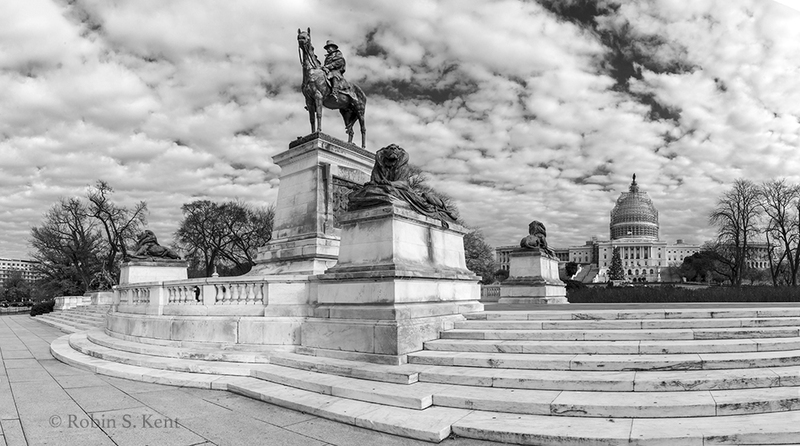 The massive memorial to Ulysses S. Grant, like so many of Washington’s monuments and memorials, has long suffered from neglect. (See, for example, a January 2011 article in the Wall Street Journal). 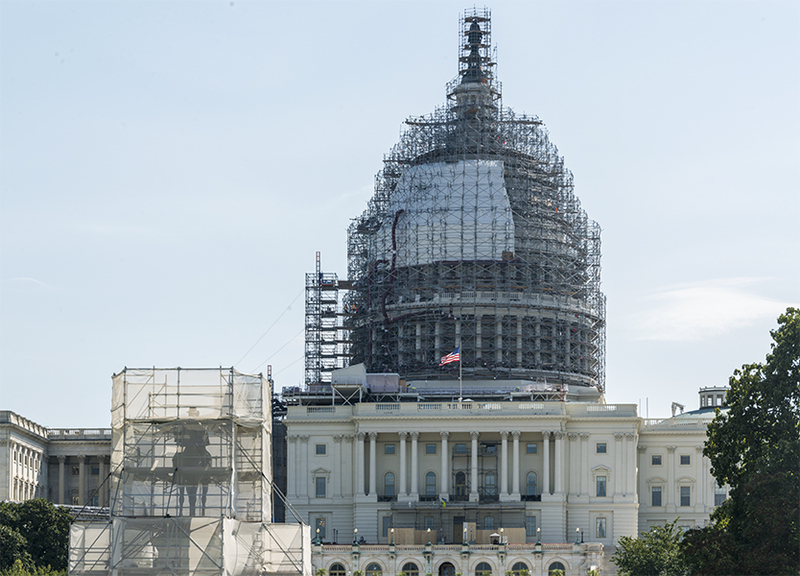 Now at last, as reported in today’s edition of the Washington Post, a restoration project is underway. 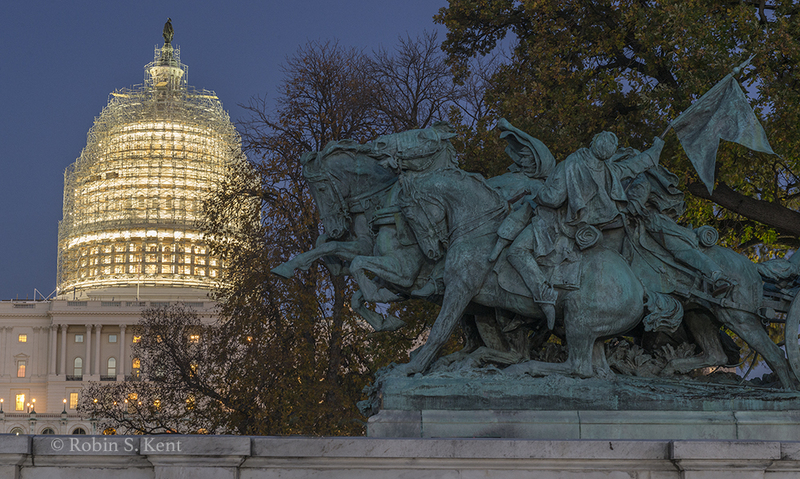 When I first photographed the memorial I knew much about Grant, but nothing of the history of the statue. But I had available a most valuable resource: James M. Goode’s imposing reference, “Washington Sculpture” and found a story that fascinated me. 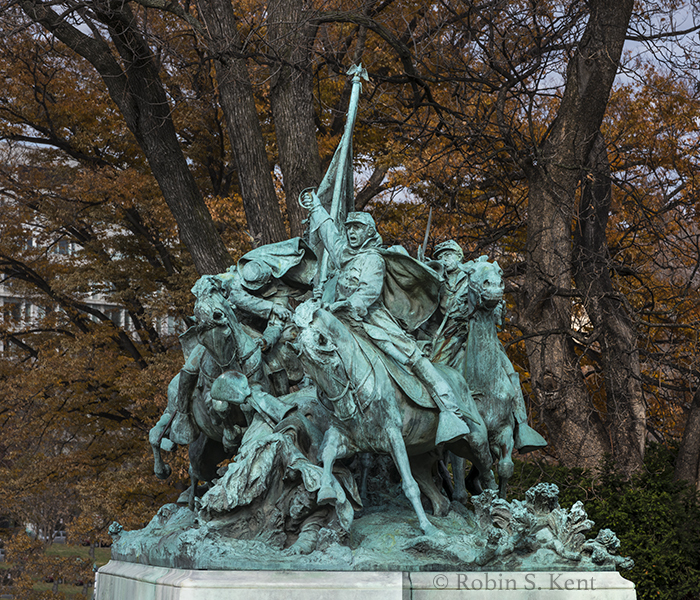 In 1901, a young, unknown sculptor, Henry Merwin Shrady, submitted design for a prestigious commission: a memorial statue of Ulysses S. Grant and the largest ever commissioned by the US Congress at that time. His 22 competitors were experienced, well-known artists and a furor erupted when the 31-yar old was selected. He was selected a second time when one of the losers demanded a retrial. This one work would consume Shrady for the rest of his life, which tragically ended 20 years later and just a few weeks before the memorial’s dedication. Before he began his work, Shrady conducted intensive research on Civil War history, immersing himself in the details of uniforms, military practices, and the anatomy and physical movement of horses. He was loaned actual uniforms by the secretary of war. West Point and other military schools conducted special drills for him to observe artillery and cavalry maneuvers. And he investigated much, much more in his unending efforts to bring authenticity to even the smallest aspects of his work. But despite his premature death, the memorial Shrady produced was unlike any other in the U.S. up to that time. It is vast, with a base 252 feet wide by 71 feet deep, and was the largest bronze-casting project ever undertaken. At its center stands an equestrian statue of Grant. Flanking him, albeit some distance away, are clusters of warriors: a Cavalry Group to the north and an Artillery Group to the south. Shrady obtained numerous postponements, fending off demands for deadlines while dealing with numerous challenges such as a fire that destroyed the foundry responsible for casting the bronze components and political fights over the proposed location of the memorial. 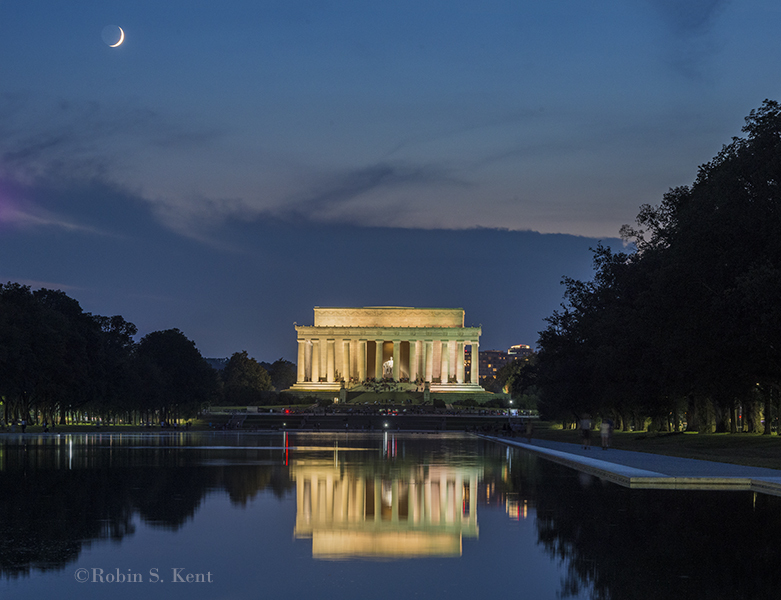 A setting crescent moon at twilight usually can be best captured about 3 days after the New Moon. 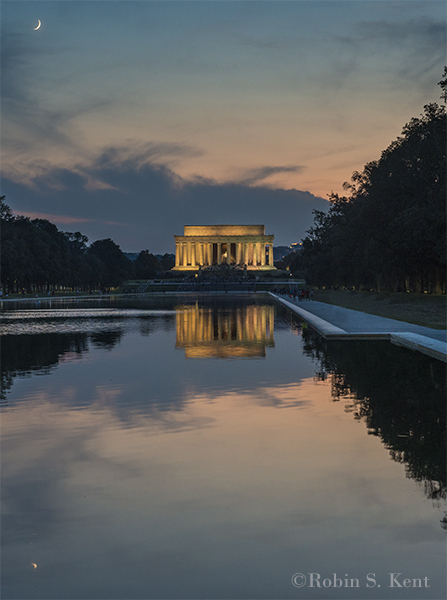 I went down to the Reflection Pool last night to see if I could catch it with the Lincoln Memorial. 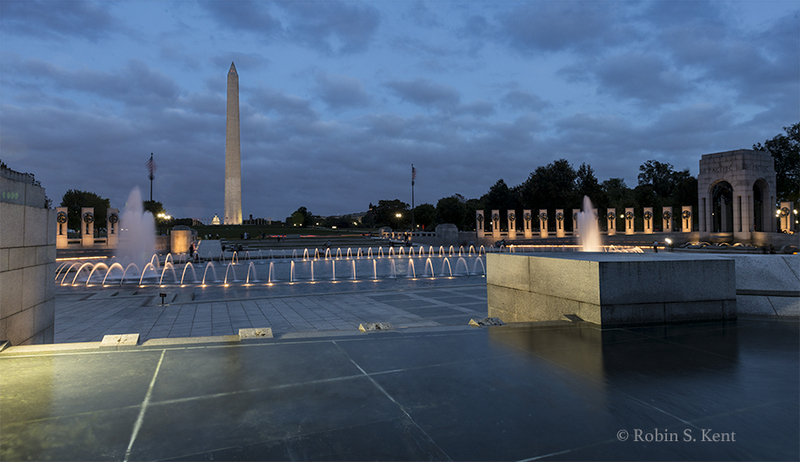 The timing on this composition is a little tricky because you need the moon to be close to the Memorial shortly after the sun has set. This doesn’t happen very often. There is about a 15 minute window when the building’s lights, the twilight sky, and the brightness of the moon are in balance. 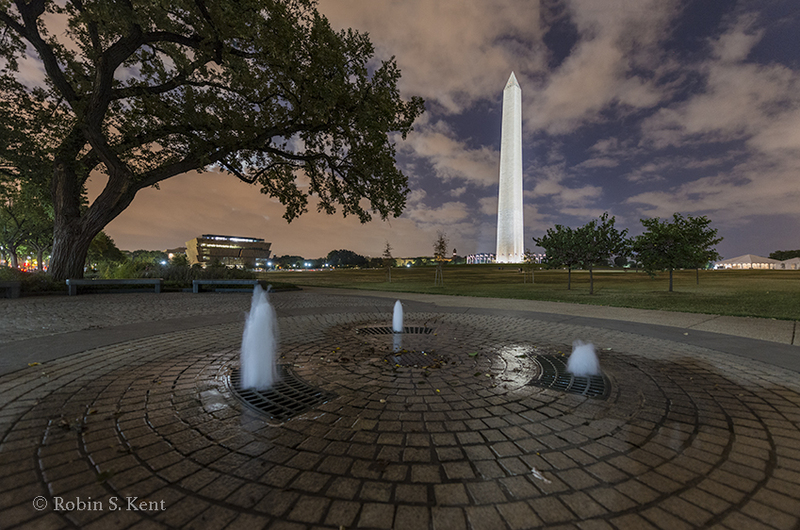 The moon was a little more to the left of the Memorial than I would have liked, so I compensated by moving to the right (northeast) corner of the Reflection Pool. The photograph above is a merge of two images so I could include the reflection of the moon in the water. The sunset was at 8:01 PM and I appreciated Mother Nature’s positioning of the clouds to add interest without obscuring the moon. There was very little wind, so the surface of the Reflection Pool was almost mirror-like. For those with a technical bent, both images were photographed with a Nikon D0800E on a tripod. The first image was captured with a 24-70m f/2.8 lens set at 62mm, 1/5 sec. @ f/9, ISO 1600. The second image (also a 2-shot photomerge) was captured with a 70-200mm f/2.8 lens set at 105mm, 3 sec. at f/13, ISO 1600. 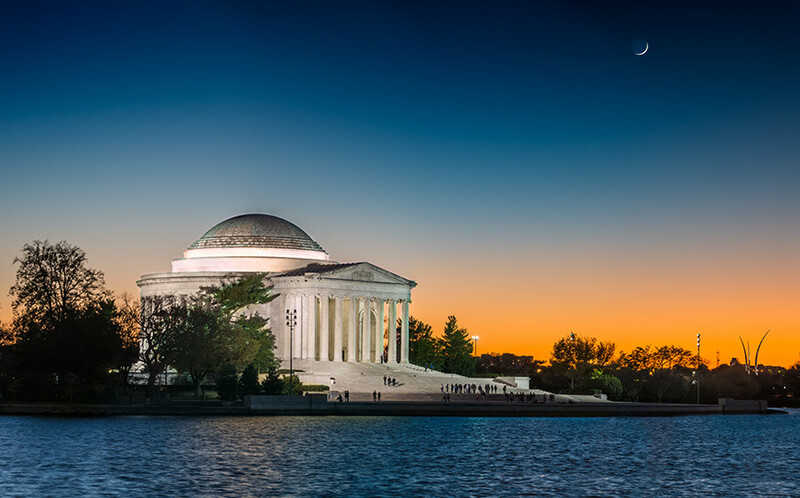 My previous post about a week ago featured a sunrise image of the Jefferson Memorial taken last April. So it might be appropriate to look at some additional images of the Memorial, but this time with the moon, especially since there was a full moon last night. The conditions may not have been perfect, but they were pretty close. 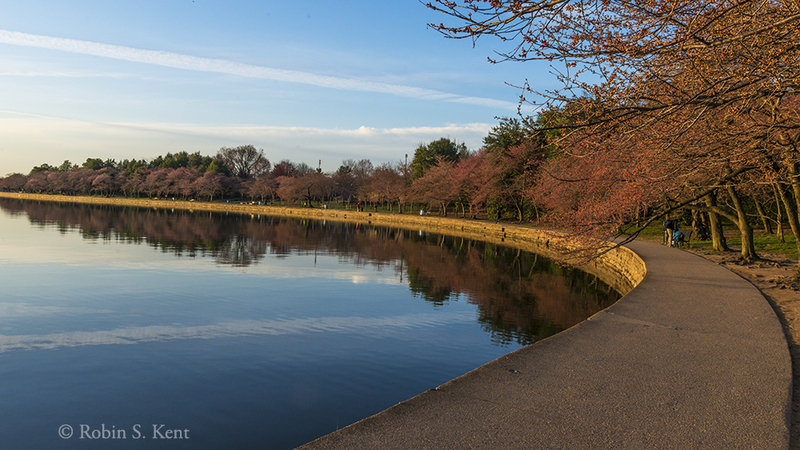 There was absolutely no breeze, so the tidal basin would produce a nice reflection. The sky was clear, ensuring that the moon would be visible. When photographing the moon, I prefer to use a telephoto lens to emphasize the dramatic effect of the moon. 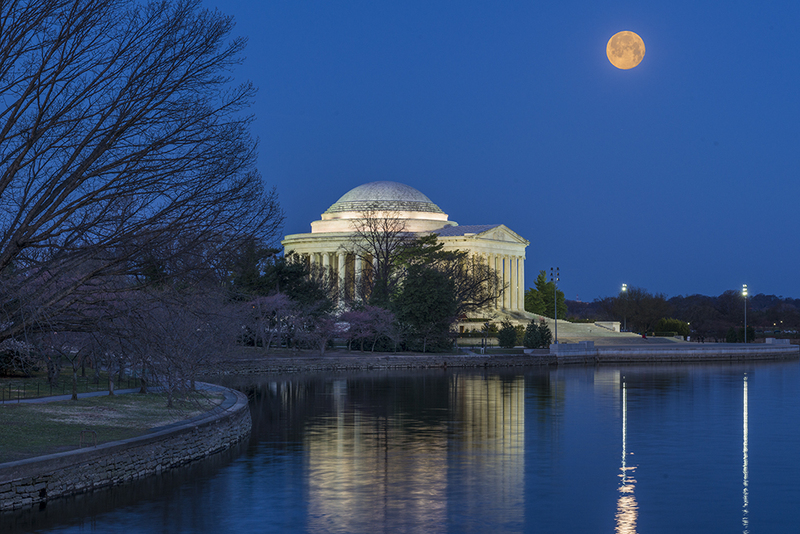 The foreshortening effect makes the moon seem larger, especially if the camera is fairly distant from the primary subject which in this case was the Jefferson Memorial. 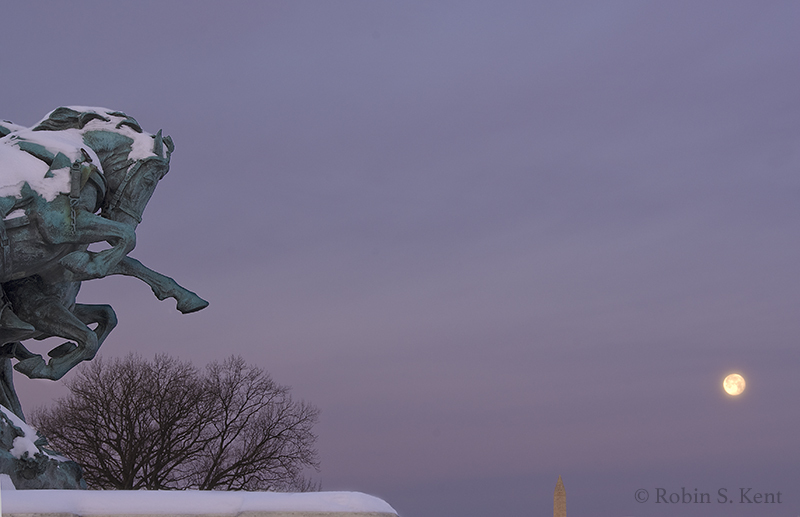 Last night, however, the location of the moonrise on the horizon dictated that the ideal place from which to shoot would be fairly close to the Memorial. 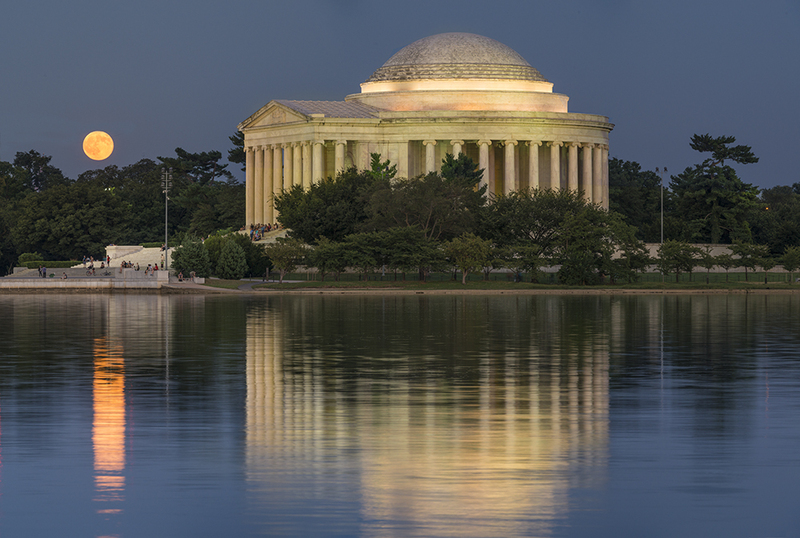 To get the entire Memorial, its reflection, and the moon in a single image would force the use of a lens no longer than 100mm. But to emnphasize the moon’s size, it would be necessary to shoot with a 200mm setting. Now there is another way to acquire a larger moon, which is considered by some (including myself) as a form of cheating. An example is shown below. The next full moon will be on the night of August 28th. 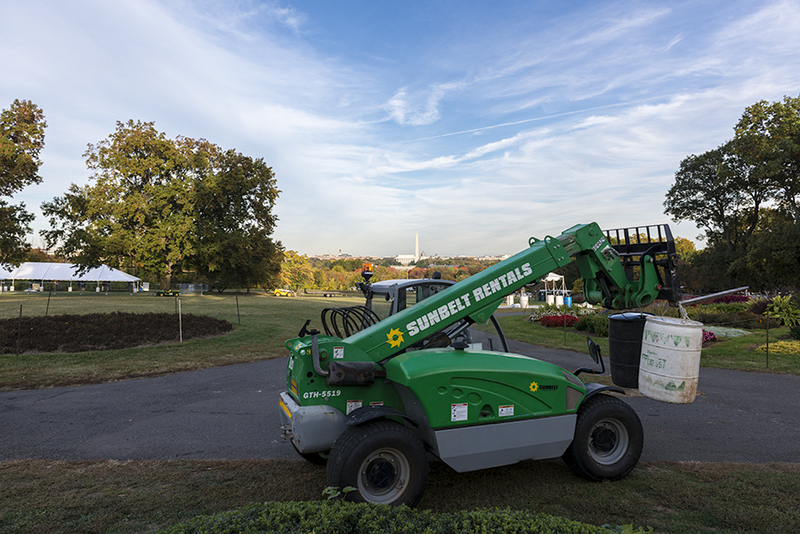 Things are moving fast down at the Tidal Basin. The partial eclipse at dawn on Saturday was a bust because of clouds, but there was a full moon rise that evening, and the Cherry Blossom Festival decided to launch a bunch of fireworks at about the same time. 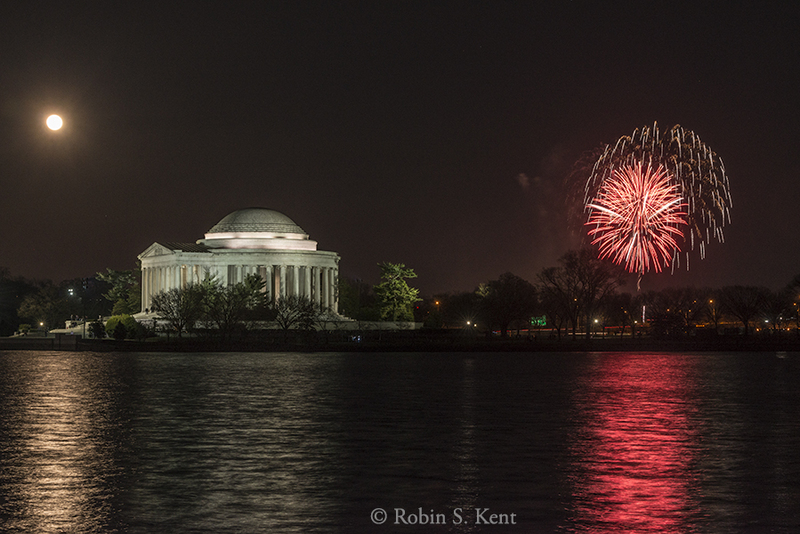 .So of course I went down to practice my Fireworks-Moonrise-Jefferson Memorial-Night Scene technique. The image below is the result. I’m not sure when I’ll get another chance at this combination, so I’ll have to be satisfied with this one unless I want to cheat. On Sunday morning I returned for another moon image, this time the setting moon with the Jefferson which would also give me a chance to check on the status of the cherry blossoms. Even in the pre-dawn twilight it was obvious that they had been busy that night because there was a pink cast to the trees that had been absent the day before. It’s hard to see in the small image below, but the so-called “indicator tree” that is typically a few days ahead of all the others was indicating good things were coming soon. There were 9,000 people attending a sunrise church service on the steps of the Lincoln Memorial but there was hardly anyone around the Jefferson Memorial. I returned again this morning and found the walkways were still virtually deserted. However, there was an incredibly long line waiting for admission to the Bureau of Engraving and Printing which was fine with me. 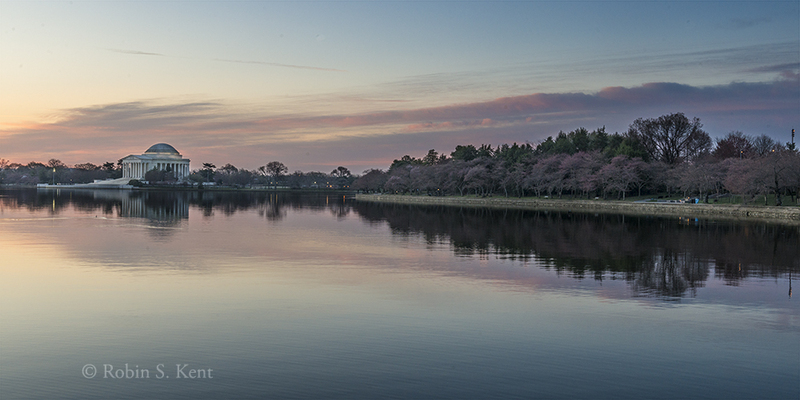 The pink tone in the trees was much stronger and the lack of wind before sunrise enabled some nice reflections. Today was quite warm so there should be further progress on Tuesday. The forecast for Tuesday calls for some rain and cloudy weather but a while back I stupidly made a morning dental appointment for this day. But I’ll definitely be back there on Wednesday, rain or shine.